The introduction of reusable sanitary pads and lessons to reduce the stigmatisation around menstruation is transforming access to education in Africa. As a girl in Uganda you have less than 25% chance of staying in school after completing primary school and, even if succeeding in getting a school place, a girl will miss three days of school a month simply because of her period. Many girls drop out of school altogether. Menstruating girls experience multiple deprivations, both material and psychosocial, which can prevent them from accessing schooling. Over the course of an academic year, a girl will miss, on average, 26 days of learning just because her human right of menstrual management support is not provided to her. Across their network of 24 secondary schools, UK charity PEAS are tackling these issues head on. We’ve set up a number of innovative ‘Girls Clubs’: each club aims to teach girls about periods and menstrual hygiene. Every girl gets a reusable menstrual hygiene kit, so she can come to school during her period without embarrassment. What’s more, the Club offers entrepreneurial projects to boost girls’ confidence and develop their skills. Girls feel they belong. The PEAS Menstrual Management Project has seen the provision of Menstrual Management (MM) kits containing reusable sanitary wear to female students, alongside the delivery of Menstrual Hygiene Management (MHM) education sessions in 10 schools across the PEAS network. Menstruation contributes to female absenteeism and reduces educational engagement. In order to combat the multiple menstrual challenges faced by girls a multifaceted approach to MHM interventions is necessary. The provision of sanitary wear constitutes an effective solution for addressing the immediate challenges presented by menstruation. However the evidence suggests that MHM education is the key to overcoming some of the psychological challenges of menstruation, as well as improving MHM practices and changing social attitudes towards menstruation. The impact for girls is clear. Absenteeism is down and exam results are improved. Debra is 16 and attends PEAS Pioneer School’s Girls’ Club. Since joining over a year ago, she has learnt about menstruation and been given her own re-useable sanitary pad kit. In the past, without any sanitary protection, Debra had to stay at home during her period, missing out on days of school every month. Now, she tells us “it is very easy to come to school” when she’s on her period. “I feel comfortable to move freely and take part in lessons”. What’s more, she doesn’t get teased or laughed at by boys anymore. At her PEAS school, she says, “everyone is treated equally, they love all of us, and the boys respect us.” In fact, most of Debra’s friends are boys, and she loves nothing better than playing football with them during break time. Some of our work also deals with combating cultural misconceptions about periods. Head Teacher at PEAS Nyero High School explains that in some communities there is the belief that “when blood is burned, you become barren”. This means that female students will often dig pits and bury their sanitary pads, rather than incinerate or throw towels away. It’s a key feature of the Girls Clubs run by PEAS that, despite the name, they actively encourage boys to take part too. As much of the stigmatisation can come from boys, it is equally important that they learn about periods and how to be sensitive about them. Godwin is ‘Champion of Girls’, part of the Girls’ Club at the PEAS Kithoma School. 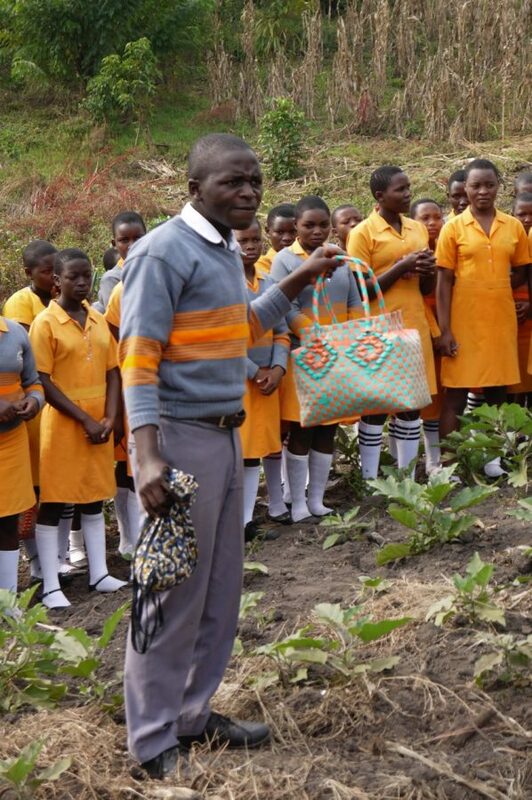 The club encourages girls to learn practical skills; besides growing crops like maize, aubergines and tomatoes, they are taught how to weave baskets. Watch Godwin talk about the Girls Clubs [VIDEO]. The project, supported by the Girls Education Challenge (GEC), will help reach 6,200 school girls in rural Uganda, through interventions in both the community and classroom, to help overcome many barriers which impede girls’ education. DFID launched the ‘Girls Education Challenge’. The initiative promotes interventions which help up to a million of the world’s poorest girls improve their lives through education. It aims to find better ways of getting girls in school and ensuring they receive a quality of education to transform their future. £30 will allow a girl to attend the Girls Club for a year. 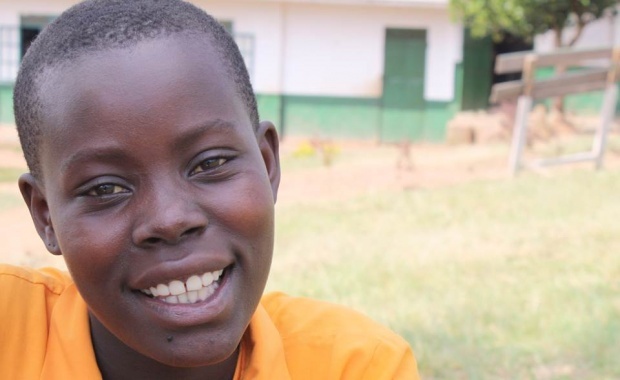 She’ll benefit from a menstrual hygiene kit, vocational training and ongoing learning about her rights within the community and the wider world.